I just got back from my morning yoga class where the focus was on balance and breathing. We went through a variety of familiar balance poses like Warrior III and Standing Split and even though I've held each pose a thousand times before, I couldn't seem to keep my balance today as I tilted and encroached on my neighbor's mat at predictable intervals. I soon realized my lack of balance had nothing to do with a positioning defect. I was going through the motions but my mind was elsewhere as I couldn't stop thinking about work or what I was going to eat for lunch. I was compounding my mind with thoughts of quinoa and butternut squash when I should be sweating clarity. Get it together Jenny! Why go to yoga and BE at Lemonade? Once I pushed the superfluous thoughts out of my mind and focused on the task at hand, I became balanced. So many of life's lessons are learned and absorbed during sweaty downward dog sessions. I wore this outfit to go shopping after yoga the other day. It's a statement making outfit that requires very little effort or pre-planning as you can't go wrong pairing bold prints with flowy silhouettes. My H&M dress and Gypsy Junkies kimono are no longer available in stores but rosietrue.com has a great selection of printed dresses and blouses for you to play, concoct, and style. Try the look. If you do, you'll definitely turn some heads. Trust. Hopefully, nobody loses their balance while straining to get one last peek at your outfit. So gorgeous! Love the dress, the acessories.. everything! Love all the colors and patterns of this look. It's so unique and pretty. I love how flowy this outfit is. Great addition with the fedora! This is such a fun mix of prints! Love this look. Your dress is absolutely stunning! And I love your nails! Great way to mix the patterns! 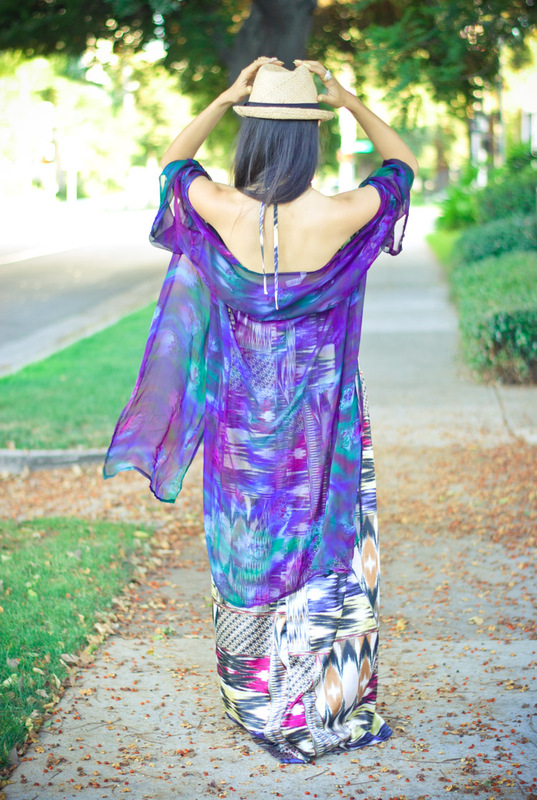 The primary color of the Kimono and the slight hint of it in the maxi, really makes this work! You are looking lovely in this outfits. I love your dress. That dress is gorgeous! It is absolutely stunning. The clashing patterns and flowy shapes make you seem like you're ready to hop on a plane to a tropical getaway! Love the summer look.